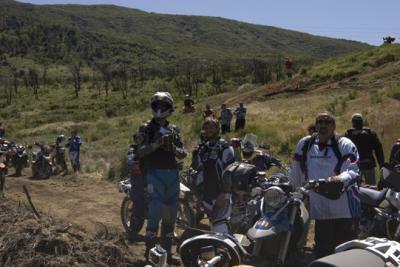 After a weekend full of meeting great people and lots of hard riding, the AltRider team is back from the 2010 Adventure Rider Challenge. They returned with scrapes, bruises, and fantastic stories. Following the river bed was the shooting competition. Earlier in the day, Jim Hyde had explained to participants that it would test their ability not only to shoot, but to do it with the adrenaline from riding still running through their veins. Staring down their hay-bale targets, the riders first shot a BB rifle, a BB pistol, and then moved on to a bow-and-arrow and knife throwing. Jacob excelled in his archery, and Paul surprised everyone with his knife-throwing prowess. Not just that he could… but that was even able to stick the knife into the bale handle-first (instead of blade first). That takes talent! After lunch came some serious challenges. Steep hills and tight turns, teeter totters, whoops, and loose dirt and sand managed to slow down a few riders. A quick turn up onto a stack of railroad ties was difficult, and contestants then faced a Romaniacs-inspired curve built with 2x4 angled planks. Missing the turn meant landing in the pool of water on the inside. Those who succeeded in missing that pool weren’t destined for dryness, however. After navigating a curvy bridge that widened and narrowed, every rider was faced with a 50-foot long pit, filled with water and lined with gravel. The first to ride through were the most fortunate, as it got muckier as the day wore on. According to Jacob, this was one of the most memorable parts of the entire weekend. 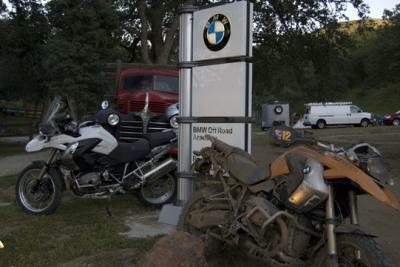 “I heard sounds I’ve never heard an R 1200 make before,” he laughed. But every time a rider got stuck, teammates and new friends rushed to help them wrestle the bike out of the pit. That evening was cold, but everyone gathered around the campfire to eat pasta, drink some beer, and meet new friends. Only 20 contenders would make it to the second round of competition the next day, and a lot of speculating happened that night as a band played to keep spirits up. The next morning you could feel the anticipation in the air, as no one knew who would ride that day. After a breakfast of perfect California strawberries, pancakes, sausage and coffee, the announcement was made. Jeremy placed 8th, and Jacob 21st. 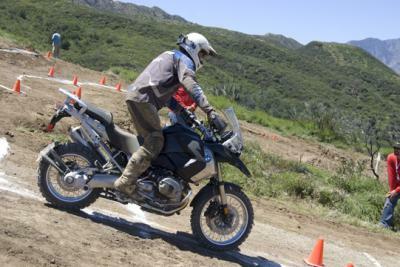 Unfortunately, because Jacob rode a BMW G 450 X, he didn’t qualify for the next round. Jeremy did move on to the final day of competition, and a lot of eyes were on him. Judges watched with hawk-like vision, trying to catch his every move to see if he made even the tiniest cone touch or dab. 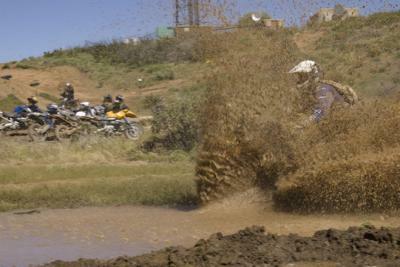 The course was quite technical, calling for trials-rider skills. The first part was over two whoops with tight cones and turns. It was deceptive – it seemed simple, but botched more than one rider. The next section demanded a tight ride through two boards running closely parallel to one another. This went on for hours as each rider rode the entire course alone. Jeremy’s ride was well executed, with one fall that most likely cost him the win. He did, however, show a great return and took on the rest of the course easily. By day’s end, Jeremy placed 5th, making him an alternate for Team USA. Although he was disappointed by the fall, he was extremely happy to congratulate Iain Glynn, a good friend and riding buddy, who took first place. We want to congratulate everyone who rode in the ARC -- just for surviving Jim’s difficult challenges! Thanks to Jim and the rest of the RawHyde team for a great event, and all the wonderful people who shared the weekend with us. And hopefully we’ll see some new faces next year, too! Awesome to see the NW represented so well. Congrats guys! This is an event I would really like to try.